This year, right after the Coach Camp has concluded, those who wish to learn more about OpenSpace Agility are welcome to purchase tickets to stay for a very reasonably-priced 3 hour workshop with Daniel Mezick. This is a unique and fantastic opportunity! The venue is be the same and we’ll start right after lunch. We will have this beautiful center to enjoy conversation and dialogue on this very important topic for the remainder of the afternoon. This is a unique opportunity to discover what agile adoption using Open Space might actually look like. You can read more about this method and workshop (and register) using the links below. The OSA Briefing is a 3-hour experiential learning event. At the briefing, you will learn the basics of OSA and experience the design and implementation of an Open Space event as it occurs in the OSA method. If you are a coach, an executive, a manager or a team member that wants to get a quick-start on the OSA method, this is the class for you. This 3-hour briefing will help you determine of the OSA method is right for your situation and context. This class is FUN and designed to give you a great introduction to the OpenSpace Agility method. Every student will get a copy of the OPENSPACE AGILITY HANDBOOK and 30 days of Q&A and implementation support by phone. 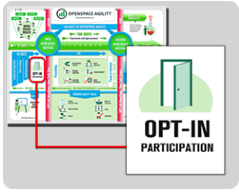 To learn more, visit the Open Space Agility website, look at the briefing’s agenda, or if you are convinced like we are, go straight to the ticket registration!